New York: Atheneum Books, 2001. First edition. Quarto, original illustrated boards, illustrated throughout. Presentation copy, inscribed by the author on the title page to his cousin, “For Chris with love Ian Falconer.” Fine in a fine dust jacket. 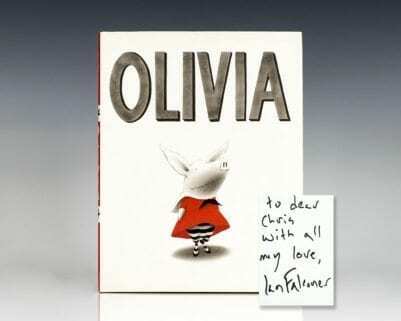 Ian Falconer is the author and illustrator of the Olivia book series, including Olivia, Olivia Helps with Christmas, Olivia and the Fairy Princesses, Olivia and the Missing Toy, Olivia Saves the Circus, to name a few. Falconer’s illustrations have graced numerous covers of The New Yorker. He has also designed sets and costumes for the New York City Ballet, the San Francisco Opera, the Royal Opera House, and many others. New York: Atheneum Books, 2000. First edition of Falconer’s first book. Quarto, original illustrated boards, illustrated. Presentation copy, inscribed by the author on the title page, “To dear Chris with all my love Ian Falconer.” Original photograph of a young Falconer to the front free endpaper, bookplate, fine in a fine dust jacket. First edition, later printing. Quarto, original boards. Signed by Ian Falconer on the title page. Fine in a fine dust jacket. 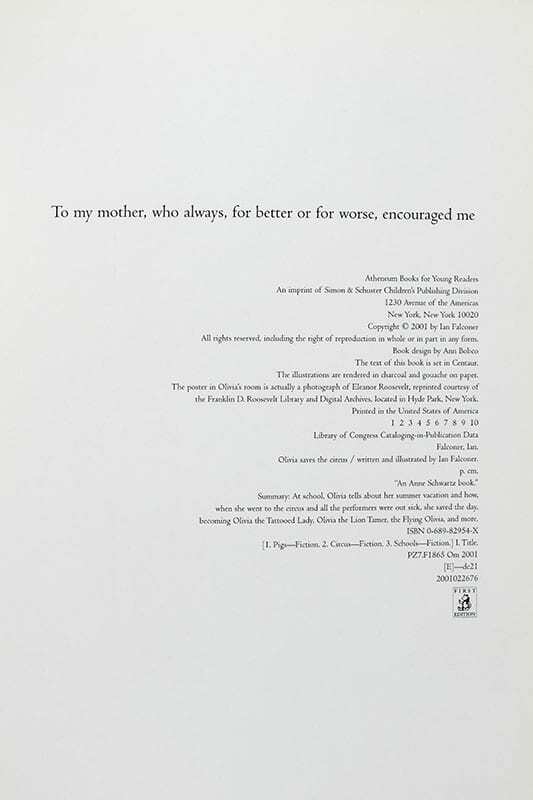 New York: Atheneum Books, 2006. First edition of the ninth book in the Olivia series. Quarto, original pictorial paper boards, pictorial endpapers, illustrated. 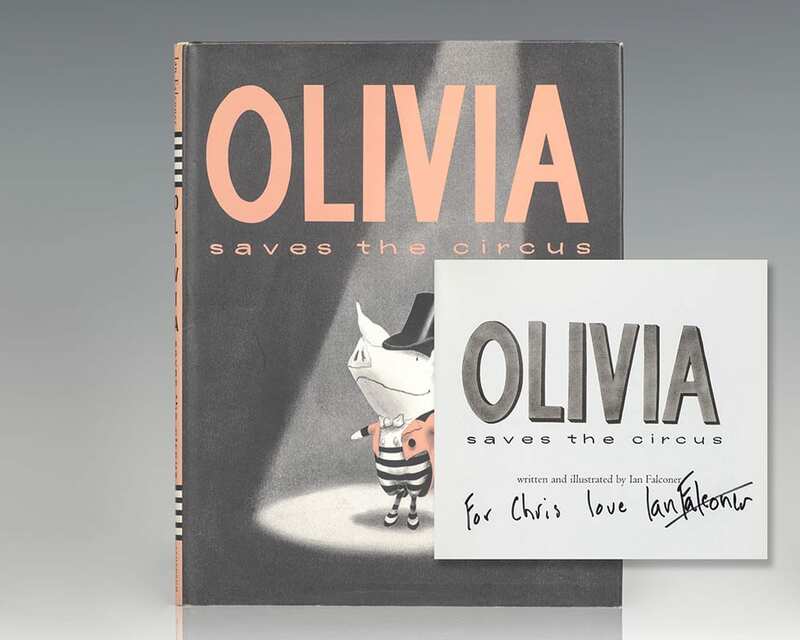 Signed by the author on the title page, “From OLIVIA! and Ian Falconer.” Near fine in a near fine dust jacket. Jacket design by Ann Bobco. First edition of the fourth book in Falconer’s acclaimed Olivia series. 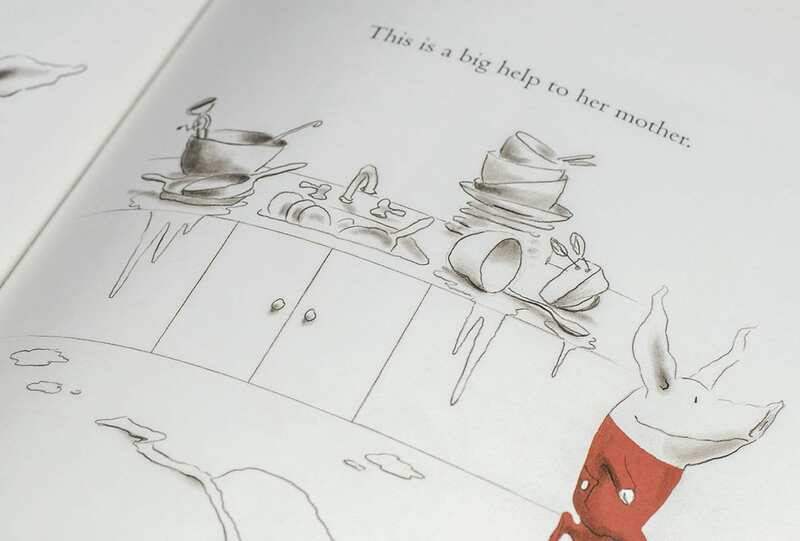 Quarto, original illustrated boards, illustrated throughout. Boldly signed by Ian Falconer on the title page. Fine in a fine dust jacket.